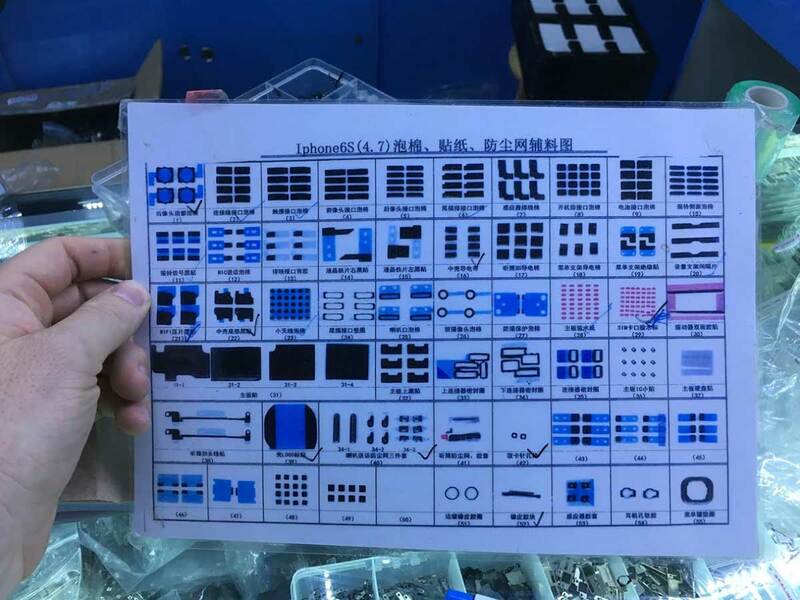 The attached photos are from one of the booths that sells screws and brackets and other accessories for repairing and refurbishing iPhones. The first photo of the laminated card is showing "foam, stickers, and dust mesh accessories". These are all the little bits of adhesive and foam and mesh hole coverings you need to make an iPhone totally perfect. Most notable are the two grids of pink dots. Those are water damage sensors, which turn red when you get them wet (the other side is faces up when installed, and is white). This is what Apple looks at to see if your phone has gotten wet. The other photo is a bin of brackets for iPhone. They're mostly coverings for connectors, or to hold the camera or other parts in place. The baggies in the upper right are camera covers - they glue into a hole in the metal shell, and are the round piece of glass that prevents the actual camera itself from getting scratched. This kit comes with plenty of components to get you started learning how to use the Arduino electronics prototyping platform. It’s at one of the lowest prices I’ve seen. If you don’t know anything about Arduino and are curious, check out Tinkercad’s Circuits website, which has an Arduino simulator.